GALLUP, N.M. (AP) — The screams of a teen caught the attention of Casey Franchot while eating at a Taco Bell. “My baby’s been shot! My baby’s been shot!” Shayanne Nelson yelled while holding an infant in a blood-soaked blanket. The 43-year-old former U.S. Army medic dropped his food and dashed across the busy the historic Route 66 highway in Gallup, New Mexico to a motel to investigate. He found what police described as a chaotic scene involving a distraught mother, a baby with a gunshot wound to the face, a confused 3-year-old boy and boyfriend trying to wipe away evidence. 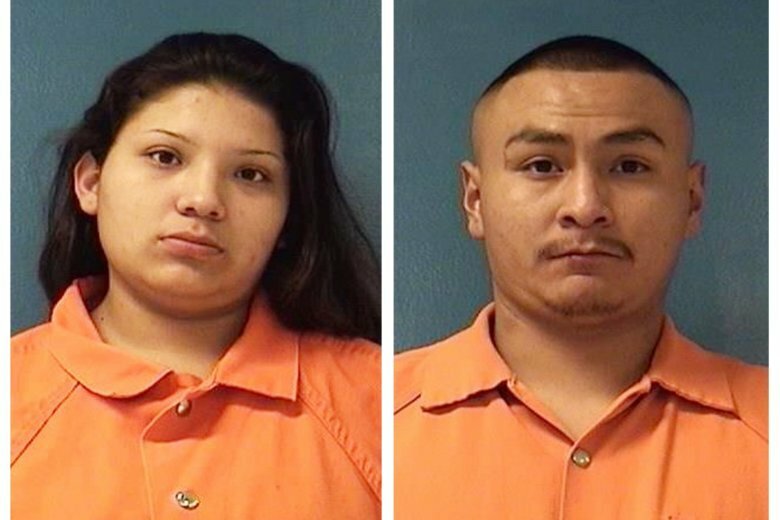 The scene also, a family member says, was the latest in a series of tragic episodes linked to a controlling boyfriend and a poor, Navajo teenage mom who hasn’t fully recovered from the death of her fiance. Gallup police say detectives are still trying to connect the moments leading to a when a bullet from a .32 caliber revolver struck the face of an 8-month-old girl near her left ear and her left eye. The bullet, one officer said, left the infant deaf in one ear and may leave her blind in one eye. According to a police report, officers arrived at the Dec. 8 scene to find Franchot working to stop the baby from choking on her own blood. A 3-year-old boy stood on the passenger seat wearing only a diaper despite freezing temperatures outside. A frantic Nelson kept punching her car and crying. But who fired the gun remains a mystery. Nelson, 18, told police minutes after the shooting that she and her boyfriend, Tyrell Bitsilly, were in a shower at the Zia Motel when they heard a gunshot. She ran out to discover her daughter on the bed and bleeding from the face, she told police. Nelson said she believed her 3-year-old found a gun left by a prior occupant and accidentally shot his infant sister. But Franchot said as he worked to save the baby’s life in the motel room, he saw Bitsilly, 21, wiping the gun with a towel. “I was also prepared to grab the baby and roll on the room for cover in case he started shooting,” Franchot said. Franchot then jumped in a police vehicle to rush the baby to Gallup Indian Medical Center. On the way, the officer warned Franchot every time they approached a bump, Franchot said. Gallup Police Officer Darius Johnson told The Associated Press in an interview Wednesday that the 8-month-old girl now was being treated at an Albuquerque hospital and is in an induced coma. At the scene, Nelson and Bitsilly were arrested and charged with child abuse. Police also charged Bitsilly with tampering with evidence. However, court records show the December shooting wasn’t the first time police linked Bitsilly to a shooting involving Nelson and her two children. In October, Gallup police arrested Bitsilly after authorities say he fired a weapon inside a car with Nelson, her mother and the two young kids. Bitsilly was charged with aggravated assault with deadly weapon, child abuse, shooting from a motor vehicle and tampering with evidence, court records said. After the October shooting, Shayanne promised to get a restraining order against Bitsilly, her sister said. The pair had been dating off and on since Shayanne’s fiance — and the father of her two children — was killed in a car accident last year, Shanna Nelson said. He was often emotionally and physically abusive, she said. But the emotionally depleted Nelson, who regularly found herself with no place to stay, returned to Bitsilly for comfort and out of fear, according to her sister. The young mother didn’t look back.